Which Amniotic Product Do We Use and Why? In our practice, we view the body as one interconnected machine with each part working together in harmony. The lumbar spine is a crucial element of this machine. The hip, knee, ankle, and foot are all controlled by spinal nerves within the low back. A problem in the lumbar spine could create problems really at any point in the lower-body. A few of the more common issues include arthritis, foraminal stenosis, pinched nerves, disc problems, muscle atrophy, loose ligaments, and spondylolysis. In this article, we will give you a brief overview of a few of these common lumbar spine problems along with their potential symptoms, causes, and treatments. First, let’s take a look at the spinal column and its parts. 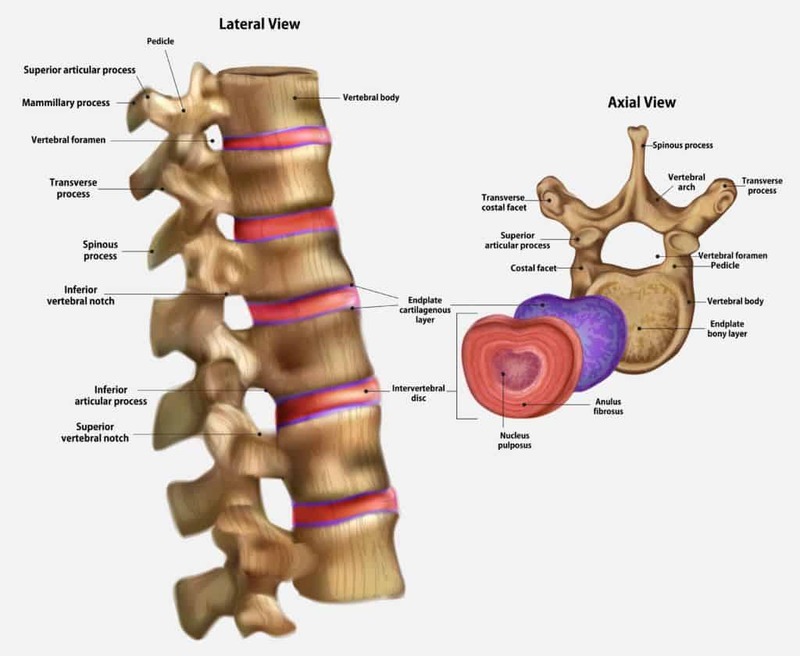 The spinal column, or backbone, is made up of vertebrae that are stacked one on top of the other with an intervertebral disc between each level to provide cushion and absorb shock. The cervical spine consists of the neck area and is made up of seven vertebrae (C1-C7). The very top of the spine is C1. Following the cervical spine is the thoracic spine (T1-T12), the lumbar spine (L1-L5), the sacrum (S1-S5), and the coccyx. The coccyx or tailbone is made up of four fused vertebrae. The posterior (back) portion of these vertebrae is known as the spinous process and on either side of these, connecting one vertebra to the next, are finger-joint-sized articulations called facet joints. This means that the five vertebrae of the lumbar spine have a total of ten facet joints. Another extremely important part of the spinal column is the spinal canal. This tunnel runs down the middle of the column and houses the spinal cord, which has many nerves that transmit muscle commands and sensory information throughout the body and to the brain. There are small holes in the spinal column where the nerves exit and branch off to other parts of the body. There is one at each level of the spinal column. One of these holes is called a foramen or foramina (plural). Any of these structures within the lumbar spine can become damaged or diseased in some way and lead to pain, discomfort, or even disability. Read on for further explanation of these potential problems. As previously mentioned, the foramen exits off of the spinal canal and is shaped like a tunnel. Spinal nerves for each specific spinal column level traverse or go through these tunnels. When the spine is healthy, these nerves easily traverse through the tunnels transmitting sensory information from each body part to the brain and provide impulses to the muscles so they can contract and move the body part. However, when the spine is not healthy, the flow of information can be disrupted. The disc or cushion in between the spine bones can bulge and/or the spine joints can get arthritis causing the foramen to narrow. This narrowing of the tunnel is called foraminal stenosis and can cause the nerves to get pinched. The pressure from a pinched nerve can cause muscle tightness, weakness, numbness, tingling, burning, or electrical pain in the specific distribution of that nerve. For example, if there is foraminal stenosis at a lower lumbar level, you could experience numbness all the way down to your big toe. If you are experiencing tingling in your fingers or tightness in your bicep muscle, this could be from foraminal stenosis in the level of the cervical spine where the nerves branch into your arm muscles and fingers. Sometimes the symptoms may slowly manifest over time from a more subtle pinching of the nerve. If the nerve is irritated, it may release inflammatory substances into the tissue to which the nerve travels which could cause that tissue to degenerate more rapidly than other areas leading to painful problems such as tendinopathy (degeneration of a tendon). You could have laser spine surgery to open up the hole, but this surgery can have major side effects and serious implications, such as damage to the thoracodorsal fascia. Another way to surgically treat stenosis is with a spinal fusion, but the mention of a fusion should be a huge red flag to seek out other opinions. Why? Adjacent segment disease (ASD) can happen in this process. After a fusion, the motion of the fused segments is limited and the biomechanical loads are transferred to the segments above and below the level of the fusion. These adjacent segments could get damaged and become painful over time resulting in the recommendation for additional surgeries. Surgery is often performed after a diagnosis of the problem comes from the findings of an MRI. An MRI indicating stenosis is not enough though to appropriately diagnose that stenosis is the cause of back or extremity pain. If you do have foraminal stenosis, you should not put all your trust into the results of an MRI. It is important to understand that patients may or may not have pain with foraminal stenosis. The MRI is just a description of the appearance of the spine. Many people have stenosis and have no noticeable problems at all. An experienced physician knows that it is critical to treat the person, not the MRI. This can usually be sorted out by a thorough history and physical examination. Research also shows that skilled physical therapy is as effective as surgery in relieving symptoms of stenosis. So, before you go under the laser or knife, we urge you to consider your options. The interventional orthopedics approach to foraminal stenosis utilizes nonsurgical regenerative medicine solutions to treat it before it progresses. Precise image-guided injections of the patient’s own platelets into the foramen and around the nerve can help manage the problem and keep it under control. The facet joints that we spoke of earlier (the finger-joint-sized articulations on either side of the spinous processes) can become injured from trauma or develop arthritis from cartilage breakdown due to wear and tear in part from extra loads placed on them when nearby discs have degenerated and from instability due to weakened ligaments. Facet joints allow for and limit (to a certain degree), movement in the spine. When bending backward, these joints become compressed and when you bend forward, they open up. This rotation is limited in the lumbar spine to about 12 degrees in either direction compared to about 40 degrees in the thoracic spine and up to 90 degrees in the cervical spine. When damage or arthritis occurs, facet joints can become chronically painful and uncomfortable, especially with movements such as bending backward, twisting, or when changing positions. When a facet joint gets arthritic and swollen, facet cysts can also develop. A facet cyst is simply a fluid-filled expansion of the covering (capsule) of the joint. A facet joint can balloon out in a few common places and one of those can put pressure on the nerves in the spinal canal. This pressure can cause pain in the spine and really anywhere along the branch of the affected nerve. The lumbar spine is the most common area for facet cysts. For facet arthritis or injuries, doctors may recommend a radiofrequency ablation (RFA) also referred to as a rhizotomy of the small nerve that senses pain from that specific facet joint. This a destructive process that damages the nerve. Although this can be an effective strategy in some cases, it may leave the surrounding muscles weaker which in of itself can be a cause of back pain. A surgical option is a lumbar fusion to bolt two or more vertebrae of the spine together to eliminate movement and therefore, pain. The nature of this surgery can also damage some of the muscles that stabilize the area. This is an irreversible procedure that can cause adjacent segment disease in the vertebrae above and below. This surgery should only be considered in the most extreme cases. For a cyst, skilled injection techniques can either pop or drain the cyst and then be injected with PRP/stem cells. These injectable solutions may be able to help in the repair of the damaged joint or at least turn the once toxic environment in the joint into a healthy one. The interventional orthopedics approach for DJD of the spine often includes high-dose platelet rich plasma, platelet lysate, or stem cell injections targeting the facet joints, facet cysts, surrounding ligaments, weakened atrophied muscles, and around the nerves. This approach is a tissue preservation strategy that involves no cutting, no surgery, no installed hardware, and no tissue destruction helping patients also avoid pain medications and damaging cortisone injections as well. Within the lumbar spine, there are four common types of disc problems that can occur. A herniated disc occurs when the outer covering of the structure breaks open allowing the inner gel to herniate out. A bulging disc is when the outer covering does not completely break open, but the fibers are stretched and weak leading the inner gel to bulge. A torn disc means that the outer cover (annulus) has a tear that doesn’t result in a herniation or bulge, but it causes pain due to ingrown nerves or the disc leaking chemicals on the associated spinal nerve. Lastly, a degenerated disc is one that has collapsed or narrowed due to insufficient living cells inside the disc producing enough of the healthy substances that usually keep the disc plump. 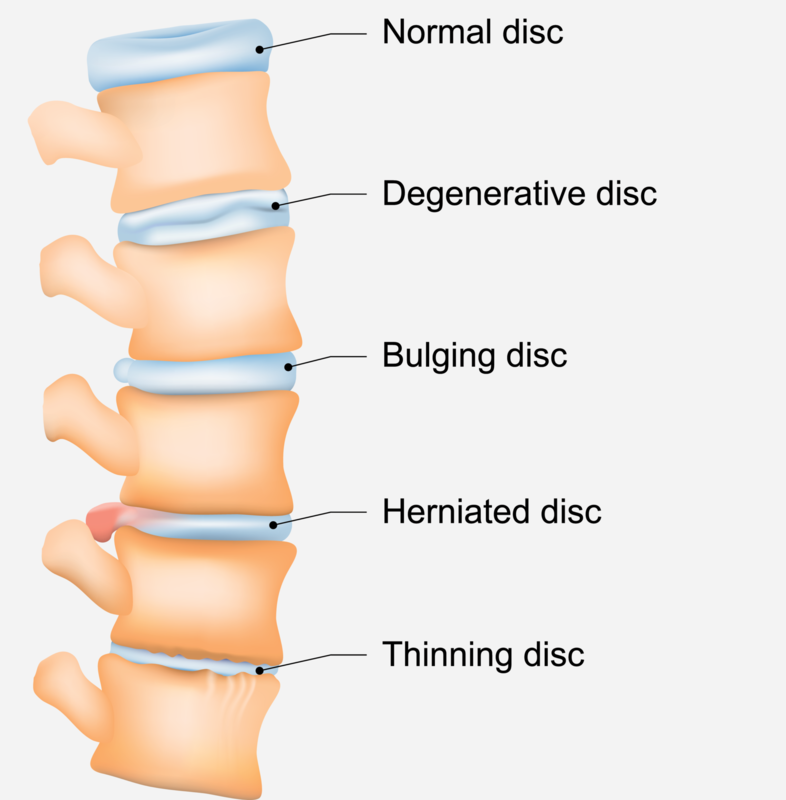 It is interesting to note that a severely degenerated disc is usually not a source of pain unless it is bulging or leaking onto a spinal nerve. 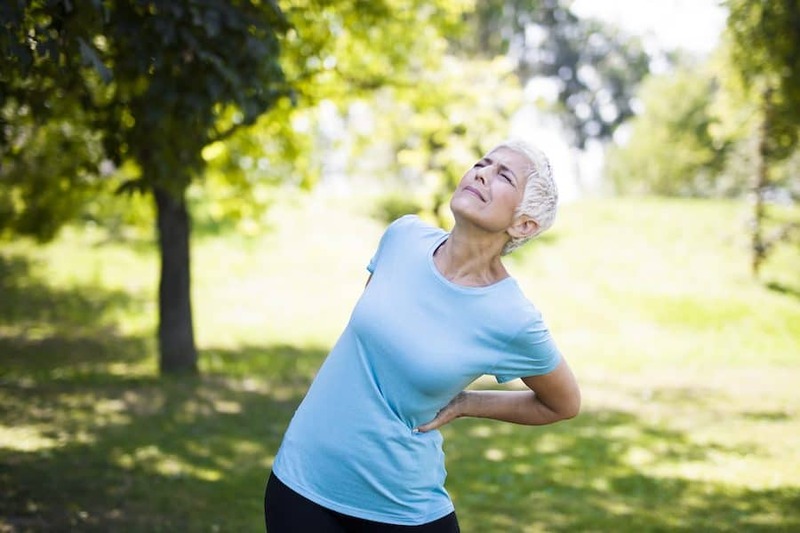 Earlier in the degeneration process, while the disc still has some height or plumpness to it, tears in the back of the disc can be a major source of low back pain that can result in intermittent severe episodes of pain or worsening with sitting, coughing, sneezing, or lifting heavy objects. Again, when the disc is severely degenerated, it usually is no longer painful in of itself. But, the mechanical load of the compressive forces in the spine at that level are no longer being taken up by the disc and these forces get transferred to the facet joints instead leading to their increased wear and tear. So, often times discs hurt when your younger and facet joints tend to hurt as you get older. Generally speaking, disc surgeries include either back fusions or disc replacement. Regarding the fusion, the vertebrae are often bolted together with hardware to keep them immobile. With the disc replacement, the goal, in theory, is to have fewer side effects than a lumbar fusion, however, research has shown that abnormal motion with an artificial disc device can also lead to ASD. Additionally, the other side effects of having a device implanted include wear-and-tear ions in the blood from the breakdown of the metal or plastic device, ongoing pain, and potential revision surgeries. With the interventional orthopedics approach, herniated and bulging discs are treated based on what kind of problem they are causing. For pinched nerves, instilling isolated growth factors or platelet lysate around the irritated nerve can help the nerve recover and become more tolerant of its narrow space. Furthermore, injection of the surrounding ligaments and muscles provides for better-controlled movements taking pressures off of the disc and nerves. In some cases, bulging discs may be able to be treated with a same-day stem cell treatment to reduce the size of the bulge or to heal a tear. In other cases, specially cultured stem cells injected in a specific way may be required. In our experience, torn and painful discs can be treated with either stem cell or PRP injections very effectively. Degenerated discs (lacking plumpness and ability to be shock absorbers) don’t respond to any type of stem cell treatment in regards to regrowing but as mentioned above, at this point in their life cycle, these type of discs are not painful but rather result in an overload of the facets in the area. However, with that said, symptoms respond well to a treatment protocol focused on platelet and/or stem cell technology deployed to treat undesirable disc and lumbar segment movements due to lax ligaments and arthritic facet joints. Many conditions can cause a pinched nerve in the lumbar spine. Examples include foraminal stenosis from bulging or herniated discs and facet joint arthritis as discussed above. A pinched lumbar nerve can cause pain, numbness, tingling, or weakness anywhere along the route that particular nerve branch supplies (i.e. the buttocks, hip, and knee). Pain may or may not be present in the low back. It is important to not only treat the nerve that is pinched but also whatever caused the problem. It is essential to understand that chronic knee pain could, for example, be due to a pinched nerve or other problem in the lumbar spine. However, if that pinched nerve is presenting as knee pain alone, it may be difficult for your doctor to figure out that it is actually coming from the back instead of the knee itself especially if there are MRI findings of the knee showing damage (i.e. arthritis, meniscus tears, etc.). These findings may be present without being symptomatic and the doctor may mistakenly jump to the conclusion that the knee is the source of the pain. This is exactly why we find it so important to consider the entire musculoskeletal system as a whole rather than in parts and to take an extensive history and physical. The surgical approach to a pinched nerve depends on the root cause. For example, if a disc bulge is to blame, it could be a discectomy and graft and/or lumbar fusion. If it is determined to be a foraminal stenosis, laser surgery may be suggested to enlarge the foraminal opening where the nerve is being pinched. Problems with any invasive lumbar surgery are many, including lengthy recovery times and often continuing pain. Ultimately, the structure never fully functions as it originally did. Our regenerative orthopedic approach is to examine the full musculoskeletal system to determine the source of the pain and the pinched nerve and then develop an appropriate treatment plan. 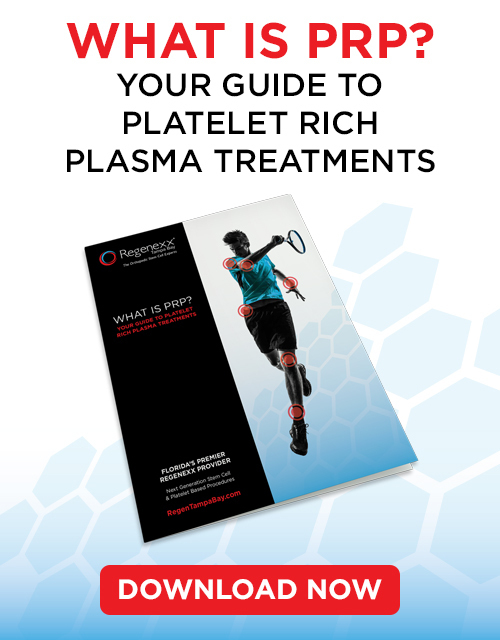 Treatment may consist of precise image-guided injections of healing growth factors isolated from a patient’s own blood platelets, PRP, or stem cells. It is likely that you may be presented with other treatments within the traditional orthopedics model for lumbar problems, including steroid shots or pain medications. Nonsteroidal anti-inflammatory drugs (NSAIDs) come with a long and growing list of dangerous side effects, such as sudden-death heart attacks, stroke, gastrointestinal bleeding, addiction, and overdose. We should mention that there are some supplements that can be a good alternative for pain and inflammation. Chondroitin and glucosamine have been shown to be effective pain relievers and can preserve cartilage. Curcumin derived from turmeric can also decrease inflammation and relieve pain from arthritis and other issues. Our spines are tuned to precision and attempting to rearrange the biomechanics of the spine with lumbar fusions and other surgeries is often a bad idea. It is also essential to understand that where it hurts may or may not be where the primary damage is located. Acting on a lumbar spine problem while it is still a small problem or ideally when the issue first appears, will be much less of an issue than trying to take care of it when it becomes a larger problem that spirals out of control. Conservative options may help in some cases, but if these options have failed, we urge you to seek out interventional orthopedic solutions to prevent the use of chronic pain or anti-inflammatory medications, damaging cortisone injections, or surgery! Join Us for a Regenexx Seminar! When I found Regenexx my surgery for a 3 level fusion was scheduled and I was dragging my right leg due to an accident. After speaking with Doctor Leiber I decided to give Regenexx a try. I postponed my surgery and had PRP on my lower back in February. By July I was back playing pickleball and riding my mountain bike. After that I had the same day stem cell procedure on my wrist due to an old injury that had turned into arthritis and limited me significantly. Twelve months later I am back throwing the football with my grandson! Regenex has helped me do the things I want to do without surgery. I have now gone to Regennexx Cayman to have my Stem cells stored. Why? I want to be prepared for my next accident!!! Regenexx gave me my life back! I had tendinosis in my right shoulder. The pain level was a 8 or 9. Dr. Torrance was very professional and took the time to explain about the PRP injection. It has been three months since the PRP injection and I have no pain. I am so happy I decided to have Dr. Torrance do the PRP injection. 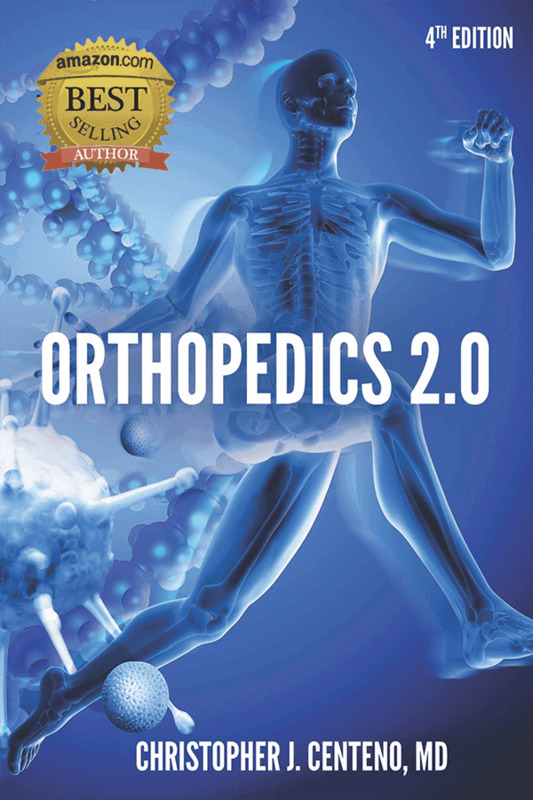 New ReGeneration Orthopedics is a member of the Regenexx family of physicians who specialize in regenerative medicine. I completed the Regenexx stem cell procedure in February 2018 to treat osteoarthritis of the hip. My primary goal is to avoid hip replacement surgery.Everyone at New ReGeneration Orthopedics was professional and caring.I've already experienced improvements in hip strength and range of motion so I'm optimistic about future progress. At age 67 I had a total knee replacement scheduled before becoming aware of Regenexx serrvices. I have A-Fib which exposes me to a high risk of blood clots and barely survived a double pulmonary embolism a year before after complications developed from an otherwise successful foot surgery. Trust me, I was not looking forward to a possible repeat of that experience and faced he knee replacement with great trepidation.The team in the Sarasota office administered stem cell and platelet injections in my "fair" rated left knee which had bone on bone damage, no meniscus, an ACL tear and multiple bone nodules in the joint. I could only walk with a severe limp and at a slow pace for limited distances, I could not climb stairs normally (if at all), I had difficulty bowling with the stress it put on my left knee, I had tremendous difficulty getting in and out of my kayak and watching me get around a golf course was a sad scenario indeed. Six months after my procedure I have virtually no symptoms. While an occasional tinge tells me my knee isn't 100%, I have no problem saying its between 90 and 95% improved. I now walk many miles a day at a brisk pace with no limp, I can bowl without any pain or impairment, I can walk up to elevated greens while golfing without any issues, and I have no difficulty getting in and out of my kayak. the bottom line is I can once again enjoy a wide range of activities without fear, pain or concern.The Regenexx procedure literally worked miracles for me. There is no doubt the process can save patients from pain and suffering while vastly improving their quality of life. And, it does so with little or no risk of medical complications. Ironically, this is also creating massive savings for Uncle Sam and the insurance companies because people like myself opt to dig into their own pockets to fund the Regenexx stem cell treatment. Adding to that savings is the fact the stem cell approach avoids multiple complications know to be associated with knee replacement surgery (including death) all of which Uncle Sam and the insurance companies also must pay to treat.One can only imagine how much money would be saved in Medicare costs alone if the government recognized the already proven effectiveness of stem cell treatments. Perhaps more important to people like myself is the fact this recognition would bring a flood of business into the stem cell regeneration arena dramatically improving the quality of life of untold numbers of our aging baby boomer population.I wish Regenexx the best of luck in gaining more momentum as time goes on. My guess is logic and results will prevail in the end versus the vested interests held by hospitals that would no longer be needed for this type of treatment and a great many orthopedic surgeons who appear focused on milking a dying cow for every dime they can by continuing to do total knee replacements. Shame on them..
© 2018 | Regenexx Tampa Bay.